Practitioners around the world reap the physical benefits of yoga, assuming poses and frequently calling them by their Sanskrit names. While many know that hanumanasana is named for the deity Hanuman, few understand why this is the case. Behind each asana and its corresponding movements is an ancient story about a god, sage, or sacred animal, much like Aesop’s fables or European folktales. Myths of the Asanas is the first book to collect and retell these ancient stories. The myths behind yoga’s spiritual tradition have the power to help students of all levels realize their full potential. Meditating on the tolerance of trees while standing in tree pose can help one become more tolerant. Learning how the disfigured sage Astavakra came to be the teacher of a king can liberate us from anxieties about our external appearance and our self imposed limitations. Marveling at Hanuman’s devotion to Ram can serve as a source of spiritual strength and determination. 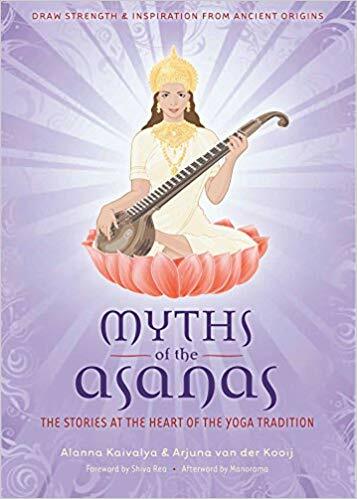 With more than sixty beautiful illustrations to frame the stories, Myths of the Asanas will add a new dimension to your practice and study of yoga.